(Dan Trimmer, 1998). Tet, (Unconditional Love x Tet Janice Brown) 22” M Dor this 4 3/4” tetraploid flower is as sophisticated as the best diploids I grow. 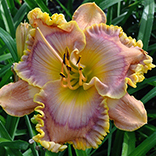 UNCONDITIONAL LOVE , the pod parent of MELANIE MAY is out of ALWAYS AFTERNOON x Tet NEAL BERREY, so the addition of Tet JANICE BROWN adds a distinctively ruffled diploid gene influx. Typically there are 2 lateral branches and about 20 buds. 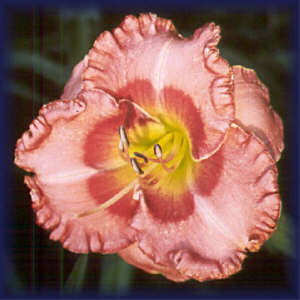 The flower is a pink lavender with a subtle plum eyezone, and a yellow green throat. Plants are medium in size with narrow arched foliage. Affectionally named for Jane’s mom, May Buckley.